Maddie that is! Let's see...Maddie sold cookie dough for her dance studio and was able to raise all but $34.00 of her tuition for the year! Thank you to everyone who bought cookie dough from her! The staff at TCC and my mom's work OCA bought a record amount! You guys are great! 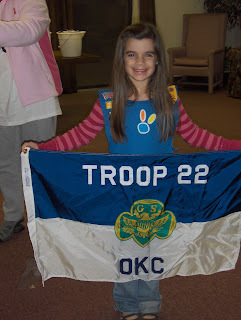 Good ol' Troop 22 Today Maddie's school had Thanksgiving dinner for their lunch. I joined her for lunch. 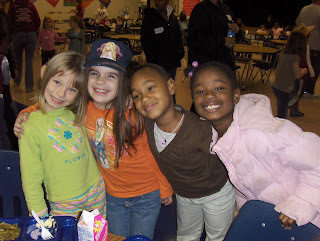 When we were in line with the rest of her classmates I realized these kids are 1st graders and this was their 'first' Thanksgiving meal at school. I heard several of the kids, mine included, make statements like, "WHAT IS THAT?" I'm guessing they've never seen turkey, dressing and gravy all lumped together! I volunteer in Maddie's classroom every Tuesday and it's been so fun getting to know her classmates. I really enjoyed having lunch with a few of them today. 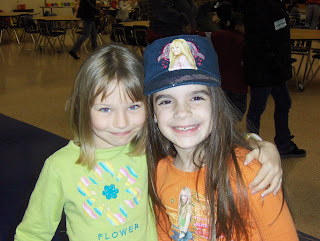 Friends... Maddie's BFF Emma Last but not least. In May Maddie asked Jesus into her heart. The last few weeks she's been talking a lot about being baptized. She met with our pastor and we all believe she's ready. So, this Sunday, November 23 Maddie will be baptized. She's very excited and so are we! I'll post pictures next week. Please pray for Maddie this is a big step in her faith and we want it to be special. Good job, big girl Maddie! Can't wait to hear all about it.